Earlier this year, I blogged here on LJ about building my Roubo workbench. As mentioned in that blog, prior to building the workbench, I wasn’t much into hand tools. Not because I had anything personal against them, but instead because I was always in the process of building out my power tool collection. My power tool arsenal is effectively complete at this point, and I have since mastered the basic uses and methods of each of those tools. I decided it was time to start doing more work with hand tools – partly for the challenge of it and partly because I thought it would be a more enjoyable and satisfying experience to do something by hand instead of by power tool. Fast forward half a year from my workbench build, and I have since purchased a few real nice hand tools. Sure enough, I find a great deal of enjoyment in planing, chiseling, sawing, etc by hand. I especially enjoy and appreciate quality tools, such as all of the Lie-Nielsen items I have since obtained. Now that I have a respectable hand tool collection, I figured the next logical step was to build a good storage cabinet for them. So here I am. I didn’t want to do a huge 10-part blog for this cabinet, because I figured it will ultimately be relatively straightforward. But still, I don’t plan on having the cabinet completely finished (and filled with tools in their final resting spots) for a year or so. I’m afraid my meticulous and perfectionist side will continually re-layout where all of the tools should go multiple times before I commit to final spots. As such, I thought I’d do a couple of blog entries along the way and then post up the final product as a Project here on LJ. After searching through all of the hanging tool cabinets within the LJ community, I felt that the one made by dpow here is the kind that would best suit me, my tools and the space where I’m going to hang it. And I was thoroughly impressed by the layout and craftsmanship of dpow’s cabinet. I’m using 3/4” thick Sapele and 3/4” Birch plywood. I wanted to use very contrasting wood colors for aesthetic purposes. And normally I would just use lots of pocket screws to build basic storage cabinets, but for this project, I wanted to be a little nicer and more artistic. 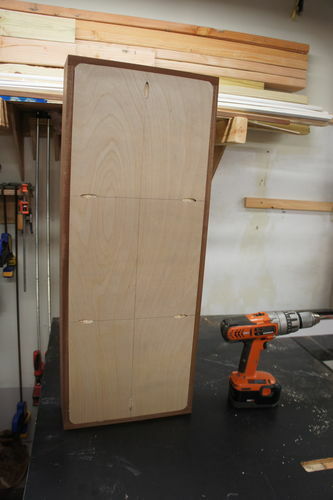 There are going to be a lot of nice tools in there, so I figured the cabinet itself should be equally impressive. I wanted to use dovetails and dado’s where possible, and hide any screws as much as possible. 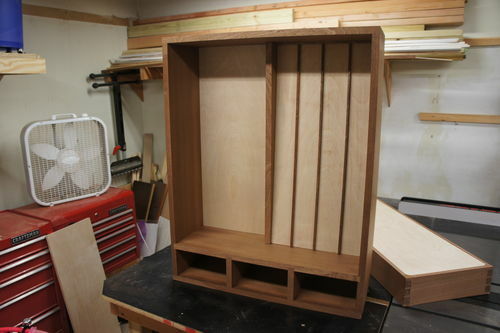 So far, I have the main cabinet done, and the doors are started, but not yet trimmed out or finished. And the main cabinet is already finished – just a few coats of boiled linseed oil to make the colors of the wood pop. 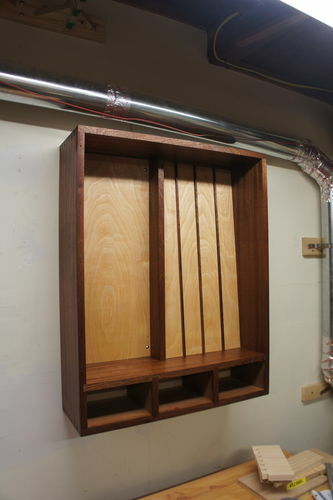 I hung the main cabinet on the wall and will slowly make the little brackets and hangers that will hold the tools. But again, it will take me a while to figure out where to put all the tools. I already built in the storage spots for the hand planes, but other than that, I have yet to account for any particular tools. Here’s one of the two doors, not yet finished. This is the front of the door. The birch panel is rabbeted into the door frame, glued and pocket screwed in. I didn’t want to pocket screw from the inside of the door, because then you would see the screws when the door is open. And obviously, since I screwed from the front side, you will see the screws when the doors are closed. So I’m going to use some thin Sapele strips to make a faux frame, mullion and transoms to glue on the front of each door to make each look like a little six-panel door. The mullion and transoms will cover the screw holes. So that’s it for now. As you can see, the sides, top and bottom of the main cabinet are dovetailed together. As are the four sides of each door. There are going to be three little drawers on the bottom of the main cabinet. And since the main cabinet is about 8” deep, I might make some kind of swing out divider wall to the left of the plane storage, so I can have two walls to store stuff on. 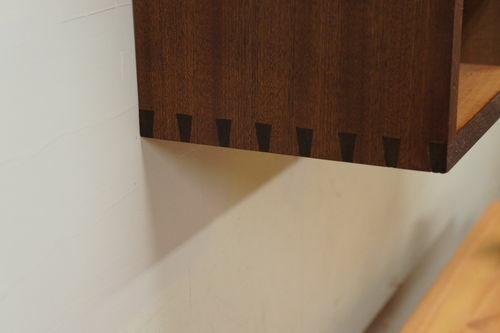 Dovetails on a tool cabinet… Fancy stuff there. Looks really good too! Looks great. I need to do the same thing for my growing collection of hand tools.